One of the most common issues we get asked to treat at Morley Chiropractic Clinic is sciatica. But, sciatica is a broad and complex thing, so we wanted to write a post which should add some clarity to our client’s most common queries. The first thing to note is that sciatica is a symptom, not an issue unto itself. If you are suffering from sciatica it means that there is a larger issue somewhere else in your body. One of the main ways in which sciatica presents itself is pain in one or sometimes both legs. The pain follows the path of the sciatic nerve (hence sciatica), which originates in the lower back and travels down to the sole of the feet. The pain varies from person to person depending on their physiology and the cause of the sciatica. It can be sharp, sudden, dull or has even been described as like a lightening bolt. It is often worse when sitting. However, tingling and numbness are also ways in which sciatica can present itself, as well as a loss of control of the leg. Important note: If you have any change in your bowel or bladder habits (either a loss of control or constipation) or numbness in your ‘saddle’ area, coupled with severe back or leg pain, then you potentially have something called ‘cauda equina’. This is much more serious issue and it is recommended you get emergency help if you display these symptoms. There are numerous causes of sciatica, but all have similar origins. As already mentioned, the sciatic nerve runs from the lower back to the sole of the foot. Its purpose is to send signals from the leg to the brain, and in turn it is the sciatic nerve which control your legs’ movement. The sciatic nerve is one of the biggest in the body and is about as thick as a man’s thumb at the largest point. Slipped/herniated disc – when the soft cushion of tissue between the bones in your spine (vertebra) pushes out. ‘Slipped’ and ‘herniated’ discs are slightly different, but both have a similar effect. A slipped disc is when tissue moves in its entirety, but a herniated disc refers to the inner ‘jelly’ of the disc breaking through the wall of the disc. Spinal stenosis – this is a narrowing of the spine, typically at the lower back (lumbar stenosis) or neck (cervical stenosis), which makes it difficult for nerves to pass through. Often this can be symptomless, but sciatica is a typical symptom of those who do have trouble with lumbar stenosis. Spondylolisthesis – is when a vertebra moves out of it’s normal position in the spine. It can refer to one or both ‘wings’ of the vertebra. There are several causes of spondylolisthesis, some are born with and others can develop it after an accident or some form of trauma. Another cause of sciatica that arguably different to those listed above is piriformis syndrome. 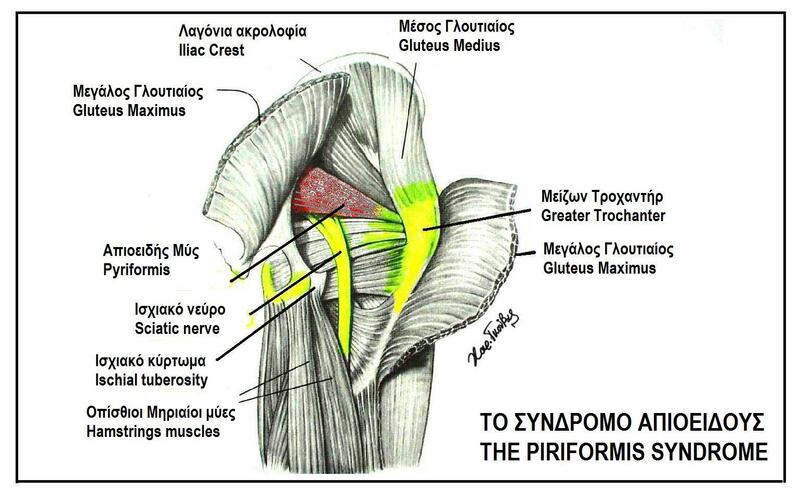 The piriformis muscle runs from the sacrum (mid-line base of spine) to the trochanter (outer hip bone). This muscle is a work horse, and is used constantly in most of our movements, but it is especially worked in athletes. The sciatic nerve runs right through the belly of the piriformis, so when the muscle is aggravated, damaged or inflamed it can impinge on the nerve and cause sciatica. What are The Possible Treatments of Sciatica? As we’re sure you’ve gathered, there are as many treatments of sciatica as there are causes. While we are about to mention a number of treatments, including at home treatments, we would always strongly advise seeking medical help first. Without it you cannot determine the cause of the pain, and while it is unlikely, without proper guidance you may make it worse. Rest is one of the most important factors in healing and recovery. While it is always important to keep moving and to stay mobile, your body cannot heal while you keep straining it. By resting you give it time to recover. Increasing your mobility via gentle stretching, yoga or pilates, may also provide relief and improve general well-being. Off the shelf medication can also provide some benefit. Ibuprofen can reduce inflammation which may provide some pain relief. Just remember that without tackling the root cause of the issue pain medication is just a bandage, not a cure. On a similar vein, be aware of pain killing drugs such a paracetamol which may lull you into a false sense of ‘recovery’. Rather than taking medication, hot and cold treatment may help reduce inflammation. In some instances doctors may suggest an epidural. These entail an injection of both painkillers and anti-inflammatory medication directly into the spine. These are relatively painless and can often provide great relief from pain. Depending on the cause and severity of the sciatica, a last resort treatment is surgery. There are several surgeries that can take place under the catch-all term of ‘lumbar decompression surgery’. Laminectomy is where a section of bone is removed from one of your vertebrae to relieve pressure on the affected nerve. Discectomies involve removing a section of a damaged disc to relieve pressure on a nerve. Spinal fusion is where two or more vertebrae are joined together with a section of bone to stabilise and strengthen the spine. How can a Chiropractor Help Sciatica? As mentioned previously, one of the most important steps in treating sciatica is to determine the proper cause. Only by doing so can a treatment method be decided and tested. As well as this, a holistic view must be taken where the patient’s lifestyle and medical history are taken into account. If you’ve read our previous post you’ll have a good understanding of how chiropractic treatment works. But to summarise briefly, we create an environment within the body to facilitate its own natural healing processes. These non-invasive, drug free methods, work on the basis that restricted movement and reduced function leads to pain. By freeing up the joints, and allowing the body’s own healing mechanisms take place unrestricted, we aim to reduce the suffering of those with sciatica.